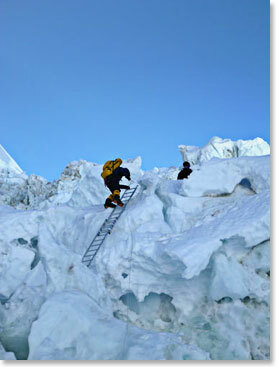 Yesterday, Tuesday, April 9, was our team’s first foray into the Khumbu Icefall. These photos will show what an amazing day it was. Today, April 10th did not dawn so well in terms of weather. 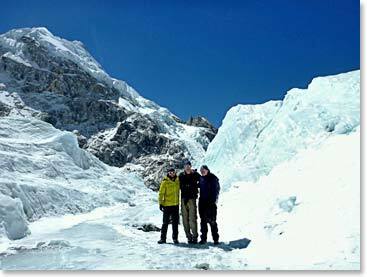 Dawa, Tsering, Tashi and A Rita woke up at 3:30 am. Their loads were already packed for a carry to Camp II. Winds were high however. 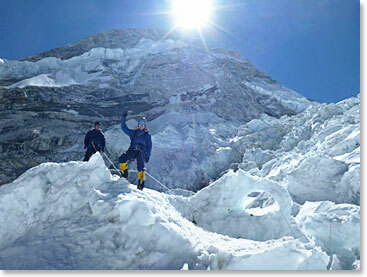 We could hear a roar above us and there were dark clouds that had appeared over Everest and Lhotse. Our weather forecast indicates that we may see some light precipitation each of the next two days. The light snowfall in itself will not mean much, but we expect high winds as well, so we will be on a “wait-n-see” mode with regard to our next move up. Meantime, there’s a lot to do here at Base Camp. 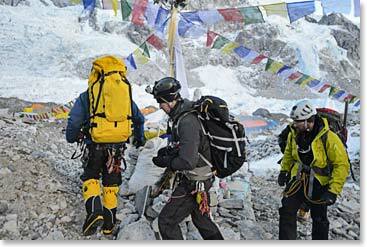 The climbing team spent the morning today sorting out medical packs for Camp II and higher on the mountain. We were very glad to have Katie Ross’s assistance with this. 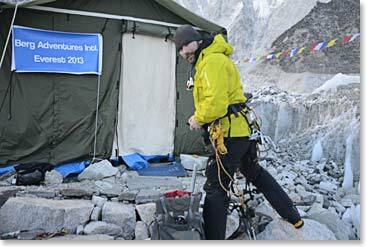 Today will be Katie’s last day at Base Camp. We are all going to miss her smile, her organizational abilities and her ability to keep Steve in line. 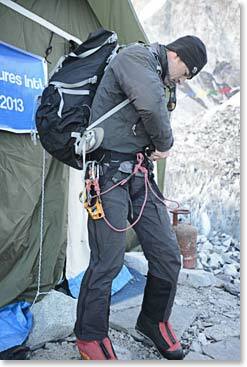 Todd prepares for the Icefall outside the dining tent. 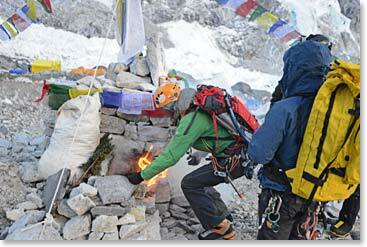 Lead climbing Sherpa Dawa (Danuru) lights the juniper fire at our chorten before the team leaves for the Icefall. 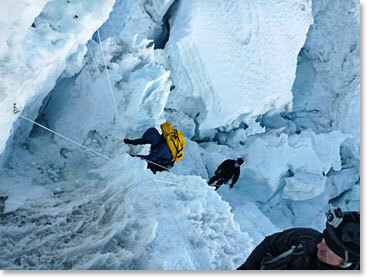 It is customary to walk clockwise three times around the chorten before beginning the climb.